Today at the office was filled with pulses of busy & not so busy. At one point I had a desk full of fifty things (it was more like 3) then nothing. Have I mentioned before I love my job? Have I also mentioned before that I am an office manager? I feel like I am playing office all day. Which is fun until it gets stressful. But I get to work & have fun & not worry about too many things related to it over the weekend. Which leaves loads of time to work on le shop. Speaking of le shop, With Love Crochet has some great items for fall! Great necklaces, earrings, bracelets, hats for your man, & all around cool goodies. Why don't you pop on over? I don't pay full price for anything any more. Well, when it comes to clothes and such. I feel there is no point. I think I may have a new goal of only buying one full price thing a month, if any (now when I say this, I mean if something is like $10 as full price. Because, well, c'mon!). Not that I go shopping at retail places every month but if I do end up doing so, I am going to try to only buy from the clearance. 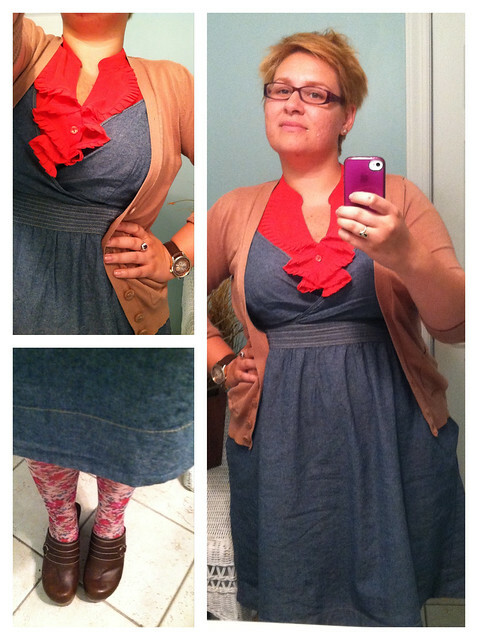 I wore this same exact dress yesterday with a different frilly shirt under it & different cardigan. Too much? Perhaps, but I freaking love it! I didn't think I would see any of the same people today but our director came in...I dunno if he noticed it was the same. whoops! I am so psyched for the fall. I can't wait for the first official day this week. I really feel like these clogs are going to be a staple. Do you think they are too outrageous? I am totally & eternally in love with them! Perhaps I've been watching too much Felicity. Who knows. Tonight I have to go home & get the house ready for Kitchen Band. A local group of friends of ours who sit around in each other's kitchens/living rooms & play instruments. I am learning to play the guitar for the second time. Music & I don't really get along. The first kitchen band I went to I played the tambourine. Talented right? Have you ever been so enamored with an outfit you wore it twice in a row? Has anyone ever caught you?